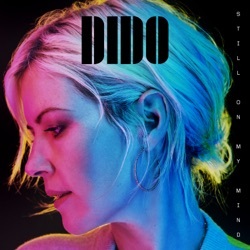 Still on My Mind is the fifth studio album by Dido, released by BMG on March 8, 2019. Much new sonic fruit across the even-dozen tracks. The album holds up well to all releases across her 20-year career and was worth the wait. It’s a strong return to form after years of changes and re-adjustments for Dido. It’s mature, artfully assembled and Dido is a twinkling presence. A continuation of her guiding principles that sound sad but not distraught, rhythmic but not vigorous, lightly brushed by folk but not by those odd harmonies, nodding to electronica and soul without looking either of them in the eye, will smooth the kinks in your life for about 45 minutes. Still on My Mind proves commendable from start to finish. A place of peace and harmony in a crazy world. "Still on my mind" is a record in some ways timeless. From start to finish, ‘Still On My Mind’ is a masterpiece. One should not wait for surprises here. On Still on My Mind, more than ever, she presents her convictions fully formed, with a confidence that can feel infectious. Still On My Mind illustrates again the singer’s clear musical direction. The overall listening experience feels less like the family car and more like a neon-lit cocktail bar. Unfazed by the passing of time, it is all elegance and soft-focus angst. Still On My Mind is a deeply warm and colorful collection of pop records that remain authentic to what we've come to know and expect from the English singer/songwriter. It lands directly and familiarly, and should please fans old and new. I just don’t feel any emotional connection with it at all. The seriousness of Dido’s style can still be a little at odds with her soothing delivery but this feels like a timely return. Ultimately, though it isn’t always obvious where Dido’s head is at on “Still on My Mind,” somehow it doesn’t matter. Still On My Mind is Dido’s most engaging album to date. The introspective narrative may not be uncharted territory, but Dido chose these waters. She is unrivalled in navigating them with her disarming and melodic harmonies. Still blending the sounds of trip hop, folk, and pop. Two decades after her debut, Still on My Mind stands impressively strong. Still on My Mind is a warm bathtub full of power pop. The singer seems to have forgotten on her sofa not only the time, but also the formulation of real musical goals. Above all, her penchant for spherical beats connects them. All this makes for an enjoyable potpourri of sounds, tied together by Dido's unparalleled voice. A slow-burning but fruitful return. Still on My Mind is reassuringly familiar – that ethereal voice is unmistakable, and the album’s feel, while current, isn’t a drastic shift in direction. It’s when her folky roots take centre stage, such as on the intimate “Some Kind of Love”, where subtle electronics add atmosphere beneath naturally lilting vocals and finger-picked acoustica, that Still on My Mind is most enjoyable. Dido’s honeyed timbre is unchanged as she returns to the subtle electronic rhythms that made her a household name. Still On My Mind will sit proudly next to No Angel as one of Dido’s best albums. She will never be the most characterful singer, but, all these years later, the effortlessness quality of her music remains strangely calming. Still On My Mind is a welcome return from an artist who’s been offline for too long. Still crafting her own vision of pop, untouched by the outside world. The album is a much welcome and stellar return to form for the one-time music superstar. All is serene and pleasantly formulaic on Dido’s latest dose of tasteful coffee-table electronica. She delivers her most expressive vocal on Walking Away, which has so little happening behind her that she has to put the shift in. The result is a collection that is distinctly Dido, a voice (clear, vibrato-less, with those swoops and emotive catches) and style recognisable from “Thank You” and “White Flag”. Finally! I have loved Dido since the beginning. Her music has always been a source of comfort, strength, & wisdom when I needed it the most. From my horrible teen years, through my crazy 20’s, and now I’m 32. In a time when music is basically pure crap, Dido is a breath of fresh air. Can’t wait to hear what she has created for us! Refreshing Beautiful lyricism and stillness, especially contrasted against the backdrop of today's sensory overload, air raid singal sounding music. Also, what a rad album cover. Fresh air Nice to hear an authentic vocal performance not compromised by crazy over-production so common today. It’s still modern and interestingly produced, it’s just not overdone. Love it. Gotta love Dido! Still sounding as FRESH if not better as the Stan days. Musical genius, awesome lyricism.